Test pilot Scott Crossfield in the cockpit of the Douglas D-558-II aircraft after the first Mach 2 flight on Nov. 30, 1953. The first man to fly twice the speed of sound, ScottCrossfield was found dead today inside the wreckage of a single-engine plane hehad been flying on Wednesday morning from Alabama to Virginia, authorities toldthe Associated Press. Crossfield's Cessna 210A was found by search crews in themountains northwest of Atlanta, Georgia on Thursday after radio and radarcontact was lost at 11:15 a.m. EDT (1515 GMT) the day before. There werethunderstorms reported in the area, though the cause of the crash was notimmediately released. "Scott Crossfield was a pioneer and a legend in theworld of test flight and space flight," said Mike Coats, Johnson SpaceCenter Director. "The astronaut corps and all of NASA are deeply saddenedby his death, but his legacy will be with us through the centuries." Crossfield, 84, made aeronautical history in 1953 when hereached a speed of more than 1,320 mph, or Mach 2, in a Douglas D-558-IISkyrocket research aircraft. Taken aloft by a Boeing P2B Superfortress (theNavy's designation of the B-29), Crossfield climbed to 72,000 feet beforediving to 62,000 feet, becoming the first person to travel at more than twicethe speed of sound, according to his NASA biography. A research pilot with the National Advisory Committee forAeronautics, the predecessor to NASA, Crossfield flew nearly all of theexperimental craft under test at Edwards Air Force Base, Calif., between 1950and 1955. Over the five year period, he flew the X-1, X-4, X-5, XF-92A, and theD-558-I and -II. 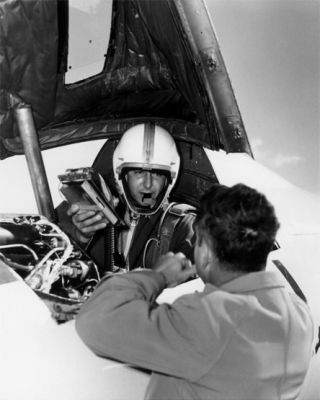 By the time Crossfield left Edwards to join North AmericanAviation in 1955, he had amassed more experience with rocket planes than anyother pilot in the world. At North American, Crossfield served as both a test pilotand design consultant for the X-15 rocket-powered plane. On June 8, 1959, hebecame the first to fly the aircraft on an unpowered glide from 37,550 feet.Three months later, Crossfield completed its first powered flight on September17, 1959. Shortly after launch on Crossfield's third X-15 flight, oneof its engines exploded. Unable to jettison his propellants, Crossfield wasforced to make an emergency landing during which the aircraft broke its backjust behind the cockpit. He was uninjured and the airplane was repaired. Crossfield subsequently qualified the first two X-15s forflight before North American turned them over to NASA and the U.S. Air Force.He flew the two aircraft a total of 14 times (not counting 16 captive flights),reaching a maximum speed of Mach 2.97 (1,960 miles per hour) and a maximumaltitude of 88,116 feet. "Scott Crossfield was a true pioneer whose daring X-15flights helped pave the way for the space shuttle," said NASA AdminstratorMichael Griffin." Today, those of us in the aeronautics and spacecommunities extend our condolences and deepest sympathies to Scott'sfamily." Crossfield continued working for North American until 1967,overseeing testing and quality assurance on the Hound Dog missile, Paraglider,Apollo Command and Service Module, and the Saturn V rocket's second stage. In 1960, Crossfield published his autobiography (writtenwith Clay Blair, Jr.), "Always Another Dawn: The Story of a Rocket TestPilot," covering his life through the end of the early X-15 flights. Crossfield later held executive positions with EasternAirlines and Hawker Siddley Aviation. From 1977 until his retirement in 1993,he was a technical consultant to the House of Representatives Committee onScience and Technology, advising its members on matters relating to civilaviation. More recently, Crossfield served as technical adviser forthe "Countdown to Kitty Hawk" project, which built and flew an exactreproduction of the 1903 Wright Flyer for the national centennial of flight celebrationat Kitty Hawk in December 2003. Born in Berkeley, Calif., on October 2, 1921, Crossfieldattended the University of Washington in 1940 before joining the U.S. Navy in1942. Commissioned an ensign in 1943, he spent six months overseas without seeingcombat duty. While in the Navy he flew the F6F and F4U fighters, as well as SNJtrainers, in addition to a variety of other aircraft. Crossfield graduated in 1949 with a degree in aeronauticalengineering from the University of Washington. He earned a masters inaeronautical science the following year from the same university and receivedan honorary doctor of science from the Florida Institute of Technology in 1982. Among his many honors were the Collier Trophy for 1961 fromthe National Aeronautics Association, presented by President John F. Kennedy atthe White House in 1962, and the International Clifford B.
Harmon Trophy for 1960, also presented by President Kennedyin the White House the year before. He was inducted into the National Aviation Hall of Fame, theInternational Space Hall of Fame and the Aerospace Walk of Honor. Upon hisretirement in 1993, Crossfield was awarded the Distinguished Public ServiceMedal for his contributions to aeronautics and aviation over a period spanninghalf a century by NASA.